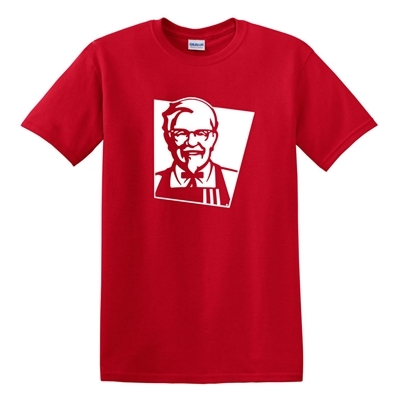 KFC E-Store - KF1051 - Colonel Tees&lt;br&gt;NEW COLORS ADDED! Call 800-331-0989 X1343 to add your franchise name to the sleeve or back of the shirt for only $2.00 each + $15.00 setup charge. PLEASE NOTE, THIS ITEM IS STOCKED WITH NO ORDER MINIMUM QUANTITY REQUIREMENT IN THE RED SHIRT COLOR ONLY. HOWEVER, WITH A 12 SHIRT MINIMUM QUANTITY AND 7-10 DAY PRODUCTION IT CAN BE ORDERED IN MANY ADDITIONAL SHIRT COLORS. PLEASE CONTACT PETER@MPCPROMOTIONS.COM FOR ADDITIONAL COLOR OPTIONS AND PRICING.